Looking for shrub and tree pruning services? Prune young trees only when necessary, and with a light touch even though. Pruning is beneficial to older, more established trees but will slow growth dramatically on younger trees. Cut away the water sprouts and root sprouts. These are the vigorous, vertical shoots — typically found in the branches and at the base of the tree — since they do nothing more than soak up the plant’s energy and are unattractive. 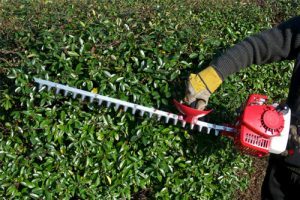 Don’t use hedge shears on bushes, unless the bush has been trained for a forma shape. Each year, lop off the oldest stems closest to the ground to make way for new sprouts. The bush will maintain it’s fountain-like shape without amassing too many stems. Base your pruning on the bush’s growth habit. Those that grow quickly and regularly should be trimmed as such, while those that languish a bit should be eased of the maintenance so often. Prune spring flowering bushes after their blossoms die away, or you may lose flower buds rather than dead growth. For more information on how to best prune the vegetation in your property, contact us today. Contact EcoScaping Landscape & Construction today to learn more about our tree and shrub trimming and pruning services.